According to Architecture and Design, The Nightingale, is a 20-unit development that would sit across from the practice’s multi-award winning project The Commons, designed to challenge the way Melbourne builds its apartments, and change the way its residents perceive these buildings. 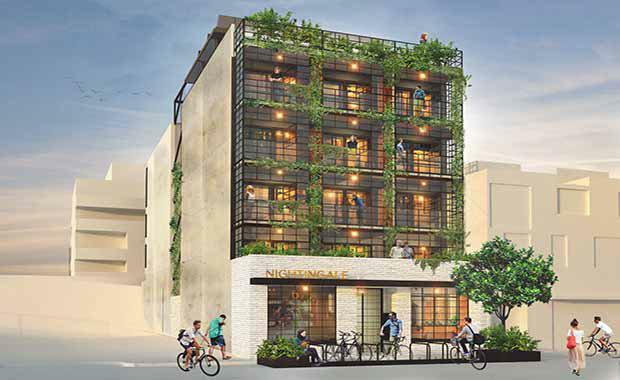 The Nightingale will attempt to surpass the environmental credentials of The Commons, being Zero Emission Ready with no gas reticulated to the apartment portion of the block. The team is also aiming for only renewable energy to be supplied to the development, both onsite and offsite. So far, $2.7 million has been raised to kick-start the development, with investors including a number of architects such as Six Degrees, Andrew Maynard and Clare Cousins. However, the project has not yet been approved by Moreland Council. asking fellow councillors to check out The Commons, “so they can understand what the architects are trying to do” with the Nightingale.